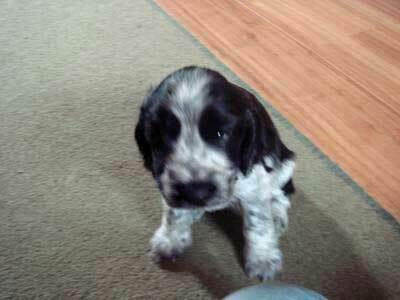 Ruby is a beautiful blue roan Cocker Spaniel who joins us next Thursday. We can't wait. We have been on sleep countdown for the past month~ any useful tips for us? Hi Tracy, Doesn't she look simply adorable? I can see why you just can't wait to get her home. As for tips - the site is full of them! Just take a look at my puppy pages first (you'll see all the links on the left hand side of each webpage. Just click on any of the buttons. And it's never too early to begin puppy obedience training! This is the most important of all if you are to have a Cocker Spaniel that grows up to be confident and happy about her surroundings. Socializing your puppy is so very necessary and it needs to be started as soon as you get her home and continued until she's at least 12 months. Hope this has helped Tracy. Good luck and happy puppy parenting! How cute is she? I just know she's going to break some hearts. She's stunning. I'd love another cocker puppy, but for the time being I just have to be content looking at photos of lovely cocker spaniel puppies like yours. Thanks for sharing her photo and enjoy her. What am I saying, of course you're going to enjoy her!